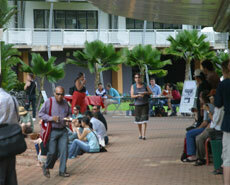 Charles Darwin University’s Casuarina campus O-Week in 2006 grew bigger crowds and a more diverse range of activities compared to 2005, according to CDU market research. This year’s O-Week pulled crowds of just over 400, which compared to figures from O-Week 2005 represented a 50 per cent increase. The new look O-Week provided activities such as the O-Week Big Concert, North Flinders International House BBQ, the Students’ Union BBQ, Education, Health and Science afternoon tea and the Staff versus Students basketball match—all attracting a high participation rate. Overall the sessions and activities, information about the University’s courses, meeting staff and students and the friendly atmosphere were elements that were rated highly by attendees. 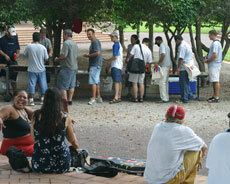 For further information regarding the statistical outcomes of CDU’s Casuarina campus O-Week 2006 contact Rekha Kulkarni on 08 8946 6721.